Probably no other point type has excited the imagination of archaeologically minded people interested in Early Americans than the Folsom point. 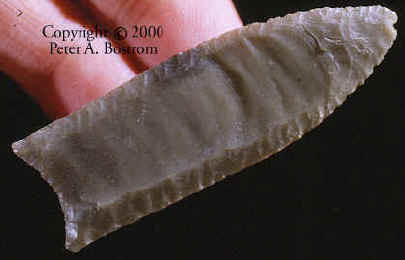 Folsom is the first fluted point recognized as being very early and associated with extinct animals. Excavation of the Folsom bison kill site located near Folsom New Mexico began in 1926, by the Denver museum. Discovery of these distinctive fluted points that were imbedded in the clay surrounding the bones quickly dissolved any doubts about mans antiquity in North America. Although considered as Late Paleo, dating approximately 8,800 to 8,600 B.C., Folsom will always have that special "mystique" of being the first. This Folsom point was found in 1945 by Bob Decker. Authentic and unbroken specimens of this size and quality are very rare. It apparently has not been resharpened or if it has, no more than once. This point is made of Edwards chert and measures 2 1/4 inches long.